After I posted my last piece, I discovered an article in the current issue of Discover Hollywood * that completes the poinsettia’s history in Hollywood. It seems that it was none other than Paul Ecke’s father, Albert, who started growing the plants in here in 1900. Like many Angelenos of the era, Ecke was headed somewhere else–in his case, Fiji–when he discovered Hollywood’s ideal year-round growing conditions and decided to stay. He settled his family on Hayworth Avenue and soon established an orchard and a dairy. 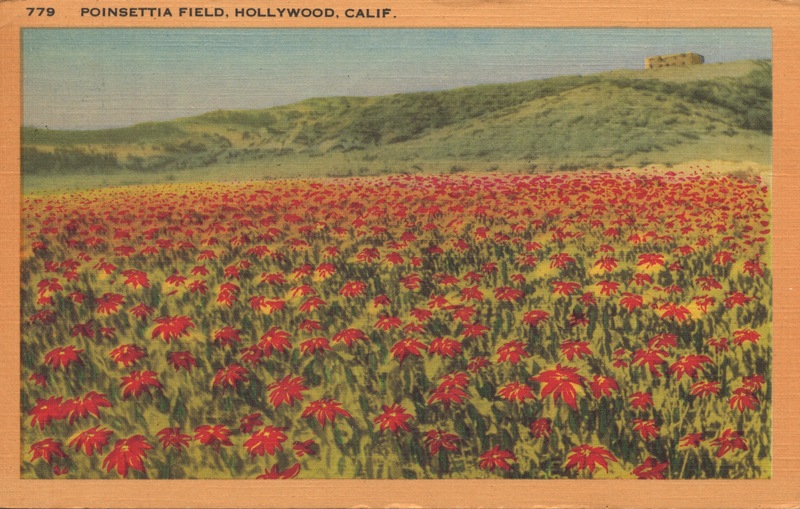 Noticing that poinsettias grew wild in Hollywood and bloomed at Christmastime, Albert Ecke cultivated them in the field on Sunset Boulevard shown in the postcard above. Father and son sold them in pots from roadside stands in Hollywood and later Beverly Hills, where winter visitors as well as locals bought them. The painter Paul DeLongpre painted them (one of his watercolors is featured in the article) adding to their popularity beyond Southern California. As many have noted, the poinsettia is memorialized as a street name in Hollywood. Now we know why. Presumably it will be soon. I was surprised to find this vintage postcard in the collection of Tommy Dangcil because I had not previously heard of poinsettias being grown in Hollywood. Judging from the single building in the hills, the image dates back more than a century, to when Hollywood still had large agricultural tracts. Most were planted with lemons and oranges, crops that would soon give way to movie studios and other commercial properties. What makes the postcard even more striking is the fact that the poinsettia was not well-known at the time, and less a commercial crop than a curiosity. Native to Mexico, the plant–despite its red color–was not even particularly identified with Christmas. Its popularization was largely the work of Paul Ecke, a San Diego County grower who not only tirelessly promoted the poinsettia as the Christmas “flower” (in fact, the red parts are leaf-like bracts, while the yellow centers are the flowers) but who, with his son Paul Jr., created the white, pink, yellow and variegated types that are available today. Because of Ecke, Encinitas has long been the undisputed capital of poinsettia cultivation, producing 80% of the world’s plants. In light of its long history in Encinitas, discovering the poinsettia’s early connection to Hollywood was an unexpected pleasure. 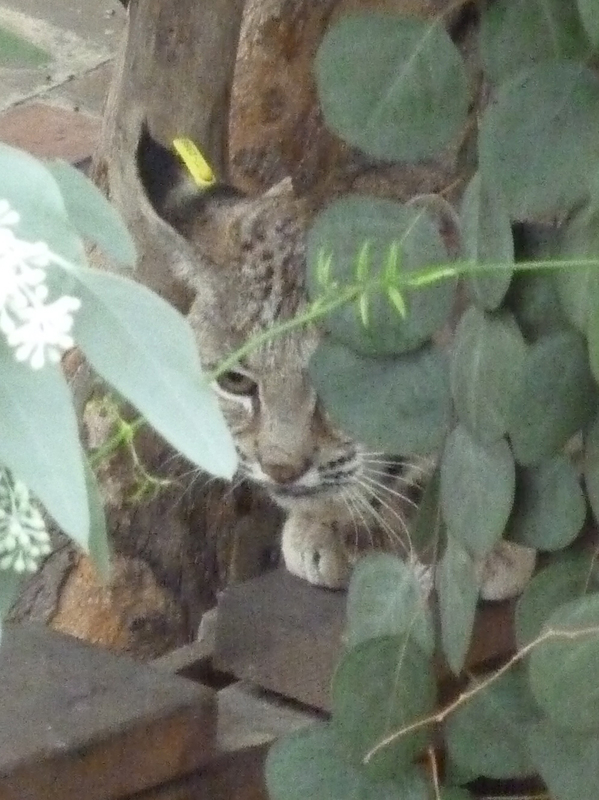 Thanks to Virginia Parry for this wonderful closeup of a bobcat–probably the same one that was photographed a half-mile north in my recent post https://underthehollywoodsign.wordpress.com/2013/11/12/wild-things-of-hollywoodland/ Keep an eye peeled, Beachwooders! 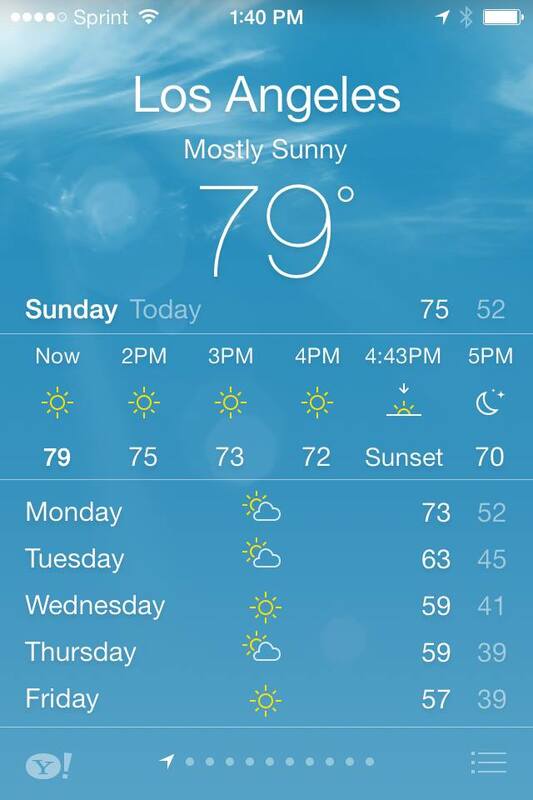 On December 1st, temperatures in Los Angeles hit 80 degrees, exceeding the unseasonably warm forecast of 75. As my neighbors put up Christmas decorations, I went swimming–outdoors. Later on Facebook, an East Coast friend wrote, “So, not really December for you.” But of course it was, along with the so-called cold snap that followed, when nighttime temperatures dipped into the 30s. A week after my swim, I was happily wearing a jacket, scarf and, occasionally, gloves. This week the temperatures went up again, reaching a high of 85 degrees on December 16th before dropping into the more normal 60s and low 70s. Unsurprisingly, I’ve come down with a terrible cold. Whenever coastal California gets a frost, there’s an explosion of commentary from colder places, to the effect of “You sissies! It’s ten below here!” This misses the point, which is that all of us expect temperatures normal for our location, not some other place. When I lived in the Midwest in the seventies, winters were brutally long and cold, bringing ice, freezing rain, grey skies and occasional snow. At the same time, Los Angeles was known for the steady mildness of its climate–a marvel approximating two springs, a long, warm, dry season, and a brief cool, wet one. As recently as the 90s, it was common for Angelenos to have neither heat nor air conditioning in their houses–we could get by without them. But now that the climate is more seasonal, it’s rare to meet anyone who can live without heat in the winter, and increasing numbers rely on air conditioning during the summer heat. During the nearly twenty-five years I’ve lived in Los Angeles, the climate has become far more extreme. December has provided a stark contrast to the normal temperatures of the LA Basin, which historically have ranged from 68 degrees during the day to 48 degrees at night, with almost no variation. So whether we’re sunbathing or digging out a pair of gloves, neither is normal for December. In a place that used to be known for its lack of weather, I check the temperature every morning. 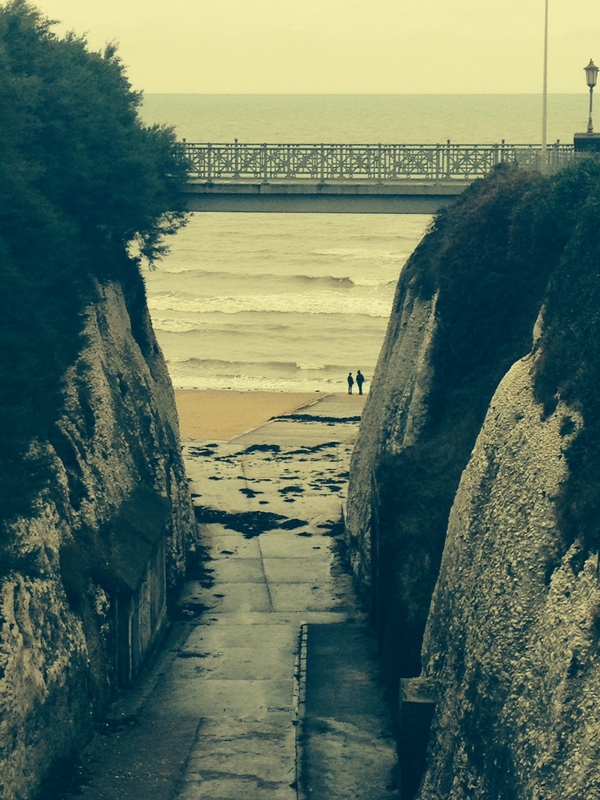 On my recent trip to England I spent a weekend in Margate, a lovely old seaside resort on the southeast coast. 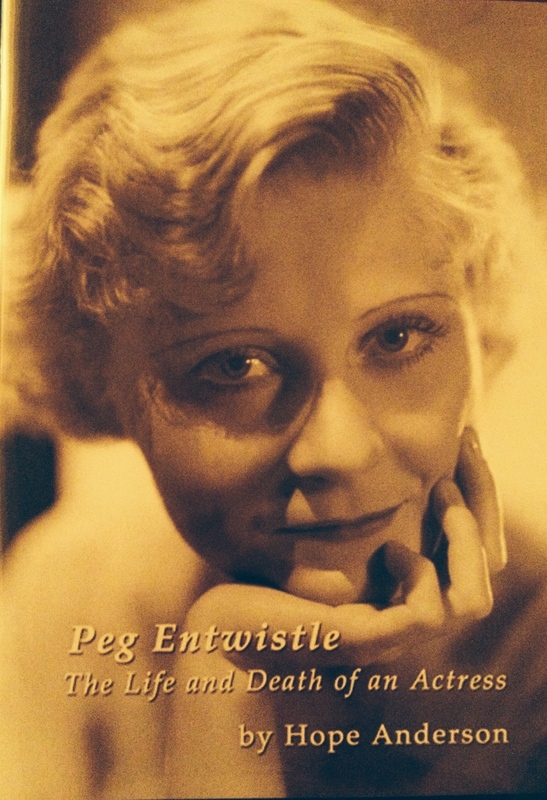 (I was invited there by the playwright Heath Woodward, whose musical about Peg Entwistle “Goodnight September” was in rehearsals, one of which I attended and greatly enjoyed.) 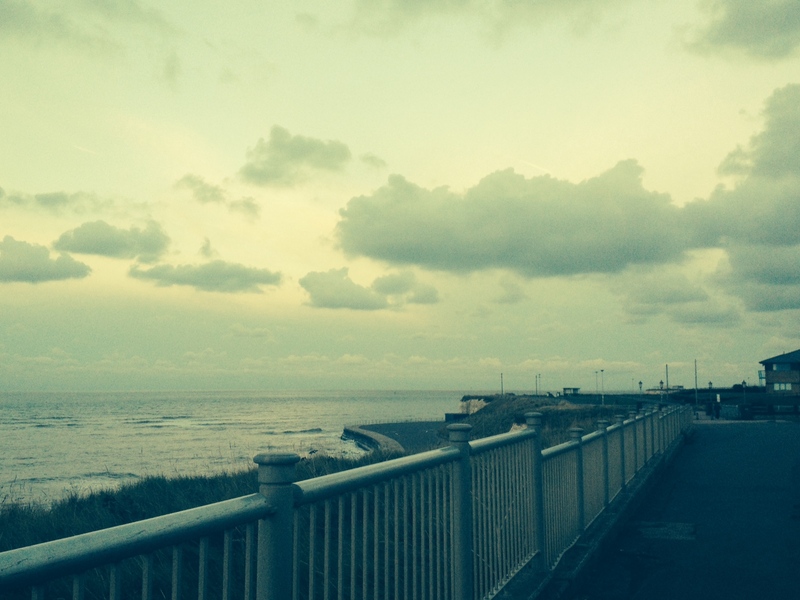 Margate is famous for several reasons, the most important of them having to do with art. The great landscape painter J. M. W. Turner painted in Margate throughout his life, producing about 100 canvases there. Many of them are seascapes whose dramatic clouds I thought were exaggerated until I saw them for myself and realized that Turner took no liberties. Then there’s the T.S. Eliot connection. Readers of “The Wasteland” will remember the passage in Part III: On Margate Sands/I can connect/Nothing with nothing. Perhaps the most moving expression of alienation in modern poetry, it was written in Margate when Eliot was recovering from a nervous breakdown in 1921. While staying at the stylish Albermarle Hotel in Margate’s Cliftonville district, Eliot worked on his masterpiece at the Nayland Rock Shelter, a three-sided glass pavilion on the Promenade. But the Margate Sands were already famous: while other English resorts have pebbled shorelines, Margate’s beaches boast the kind of golden sand associated with Italy and Spain. 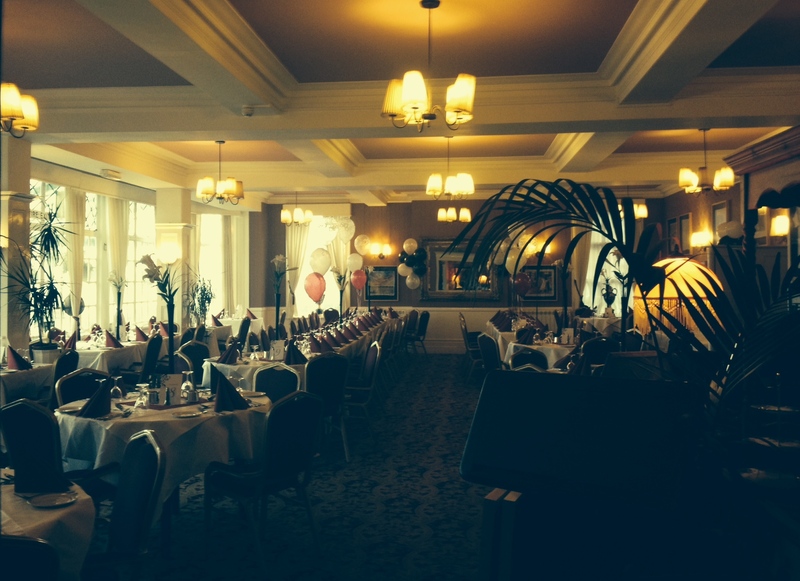 The Albermarle is long gone, but the Walpole Bay Hotel, where I stayed, is a worthy successor. 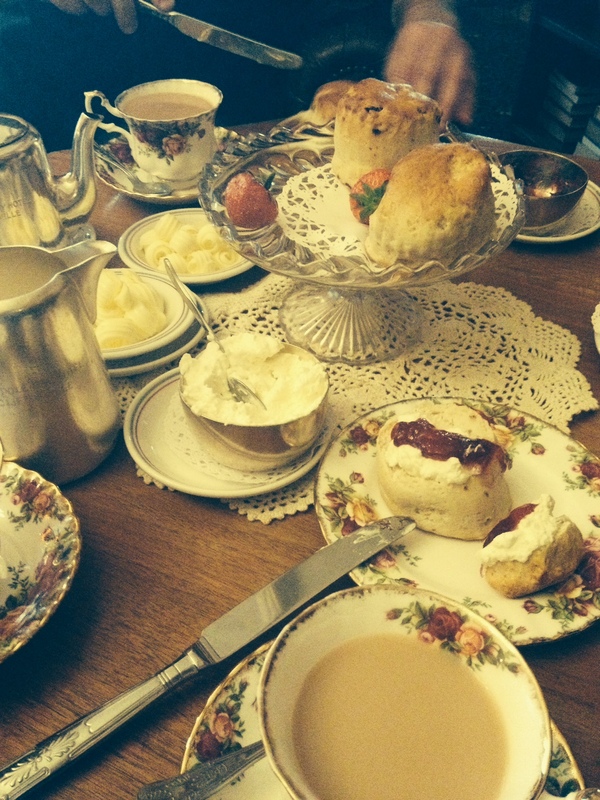 A graceful Victorian-era landmark just off the Promenade, the Walpole Bay features cream teas, Sunday lunches and a museum of Victorian and Edwardian artifacts collected by its charming owner, Jane Bishop. There’s also a gallery of artwork drawn on the hotel’s linen, a tradition begun when a guest started sketching on his napkin in the dining room. One of the contributors to the Napery is the Turner Prize-nominated conceptual artist, recent CBE and all-around badass Tracey Emin, a Margate native who stays at the hotel during her visits, but most aren’t as famous, or even necessarily visual artists. I found the collection fascinating, and when Jane presented me with a napkin at the end of my stay I knew exactly what I would do. 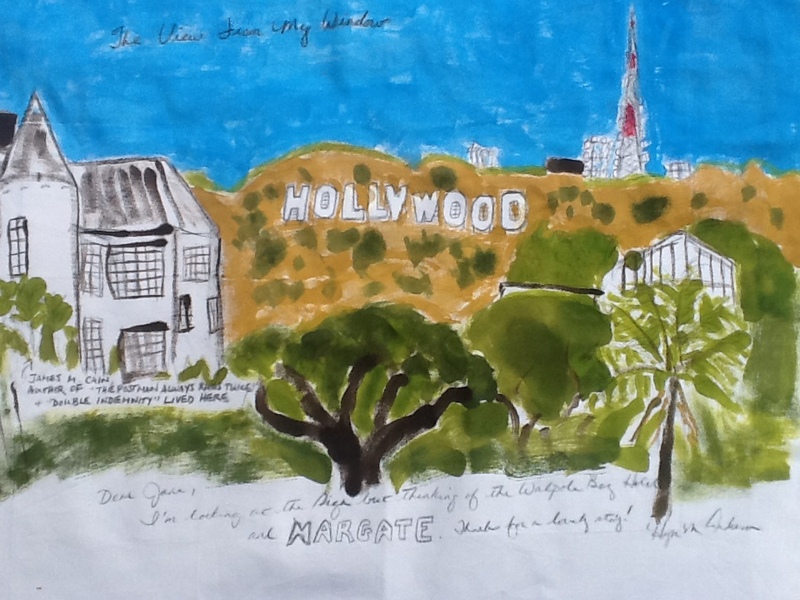 The result is pictured above: the view of the Hollywood Sign from my upstairs window, painted with acrylics. 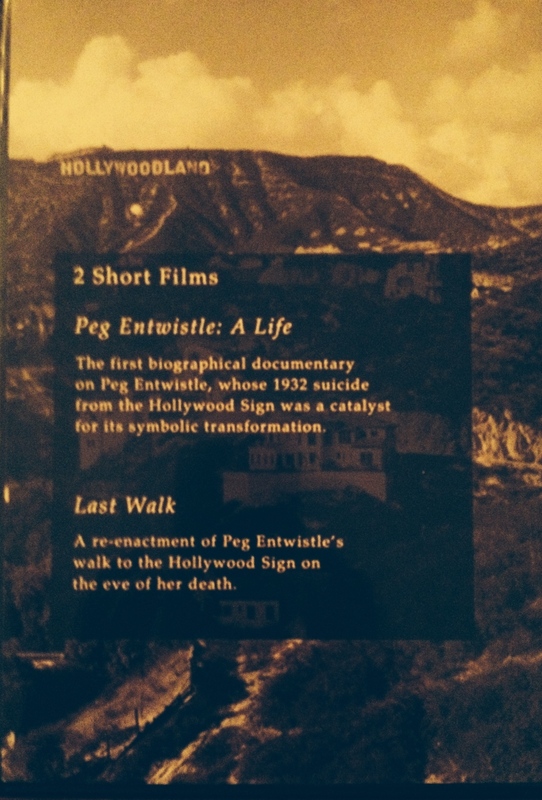 You are currently viewing the archives for December, 2013 at Under the Hollywood Sign.